Developmental orthopedic disease (DOD) -- This is a broad and general term for muscoskeletal disorders/limb abnormalities, and covers a number of conditions: Osteochondrosis, contracted tendons, acquired angular limb deformities, ephysitis, subchondral bone cysts, flexural deformities, and juvenile osteoarthritis. Osteochondritis dissecans (OCD) : Now we're talking. 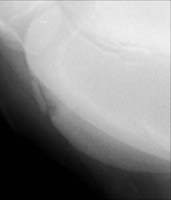 When the normal conversion from cartilage to bone is interrupted or proceeds abnormally, some areas do not fully convert to bone. There may be a lesion or weakened area on the bone/joint--either cartilage or a mixture of cartilage/bone. The weakened area may break away from the bone or partially break away, forming a flap. This can cause swelling and pain/lameness. The term for this condition is OCD. I hope to write more on practical things related to bone development--like what specifically to focus to ensure normal bone development in your young horse--stay tuned. Please please write a follow up! I'm getting my first baby and I know I will be a crazy mess when it comes time to feed him, lol! Baby horse??? Details, I need details!!! He's a little Friesian sporthorse Colt out of Blue Eyed Dream... He's getting shipped from Florida to New Jersey in about two weeks, and I am ecstatic! Please write more - my horse just had OCD surgery in both hocks and they tell me he will do just fine. But if it had been in his stifles, well, he would have been done. why are hocks worse than stifles?